The market is starting to make the OG a little queasy. The foregoing information is current only through 9/5/14 and includes trades discussed in posts published to and including 9/29/14. In prior updates, I would link the stock fund deletions and additions in one section, and then compile the links to the individual stock purchases and deletions in another section. To monitor more accurately what I am actually doing, rather than what I think that I am doing without double checking the factual basis for whatever belief is formed on the subject, I will now have one section that will simply keep a running total and will make those calculations every weekend. Given the number of trades, I certainly can keep the correct math number in my head. To lessen the burden in this exercise, I will not include stock adds or deletions when the value is less than $500. Instead, I will just assume that those transactions, mostly LT selections, will just cancel each other out which may not actually be the case but close enough. I will also round the cents to the nearest dollar and will exclude commission costs. Another slightly inaccurate assumption made for ease of computations is that 1 CAD=1 USD. I am just trying to get an approximate number with the following. Another assumption is that a balanced fund is 100% stocks which skews the results some. I do not want to go and check whether the Janus Balanced fund has 65% stocks/35% bonds, or 70% in stocks and 30% in bonds. I simply classify balanced funds with a greater than 50% stock allocation as part of my stock allocation for purposes of this exercise only, and others may want to actually segregate out the investments into stocks and bonds exactly. There are several starter positions in low cost ETFs that I can buy commission free. For the most part, I do not discuss those trades unless the amount is over $500. The small buys are due mostly to my opinions about current market valuations, which I view as stretched, and zero need to push the envelope. 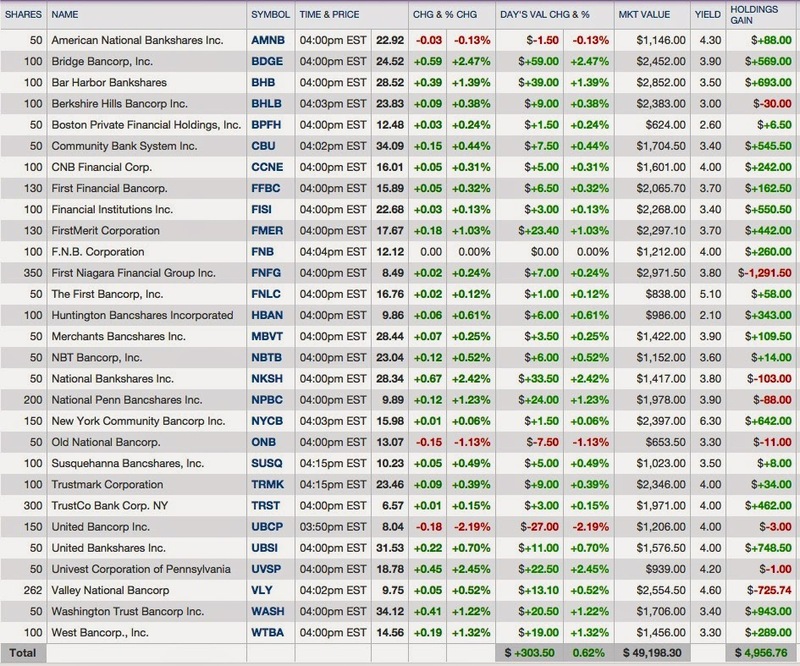 In that account, I have been buying those low cost stock ETFs in very small pieces with realized gains from bond trades. I will discuss the 10 share purchase of OEF in the next weekly post. Since early June 2014 and through my 9/20/14 post, I have reduced the stock allocation by about $72,229. A good chunk of this reduction comes from stock funds which can be seen by comparing the following table with the earlier one referenced above. After completing this planned reduction, I decided to reduce the stock allocation further by another $23,000, which would eliminate the net stock additions made between October 2013 and February 2014. After experiencing some success with this strategy, I now have a requirement that my total investment in all LT holdings can not exceed my total realized gains for this basket strategy. My total exposure is substantially below my net realized gain number, so I currently have a lot of available capacity to expand this basket under this particular risk control rule. There was one deletion and addition since the last update, both noted below. This basket is having a bad September. Some of the leading gainers have retreated in price and a few other names, formerly just detractors from the overall performance, look like they want to make a hard run to zero (e.g. : KWK, SUTR). That is to be expected with a falling knife strategy and I have had some BKs. In my mind's eye, I was basically using my bond profits to buy 100 common shares. For the 2014 second quarter, Cenveo reported a 17.9% increases in revenues to $479.4M (organic growth up 2%) and a 6.7% increase in "adjusted EBITDA" compared to the 2013 second quarter. Second Quarter 2014 Earnings Release The increase in sales was primarily due to the integration of National Envelope (NE) which had been operating in BK. Cenveo Enters Agreement to Purchase NE Cenveo acquired substantially all of NE's operating assets in September 2013. Cenveo had an adjusted GAAP loss of $.03 share, which excluded a charge relating to debt extinguishment. The chart looks awful, with the shares trading below their 50, 100 and 200 day SMA lines at the time of my purchase. CVO Interactive Chart That is par for the Lotto course. The maximum chart looks interesting with mountain tops hit near $25 in both 1998 and 2007, followed by waterfall declines to a splat. The company has too much debt in my opinion. A slither of equity supports a mountain of debt. At a $2.85 price, the market capitalization is about $194M and the company had $1.252+B in debt as of 6/28/14 (page 2 and page 11, 10-Q referenced above). As noted at page 11, the company has retired some of the higher cost debt, but still had $225M outstanding of an 11.5% senior unsecured note as of 6/28/14. I will publish, probably within thirty days, a Gateway Post for this topic which will aggregate my profit/loss snapshots since I started this basket strategy in September 2013. 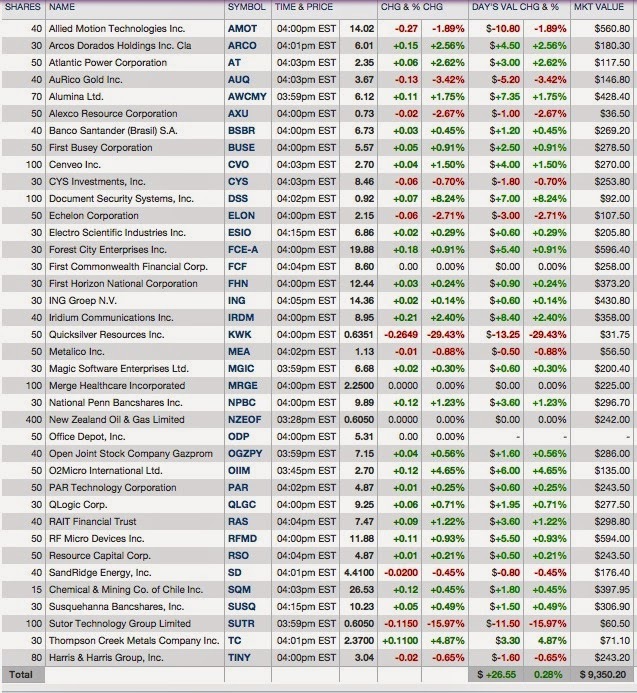 I added last week 50 shares of MPW at $12.33 and 30 shares of EPR at $50.72 yesterday, which are included in this table, but will not be discussed until the next weekly post. 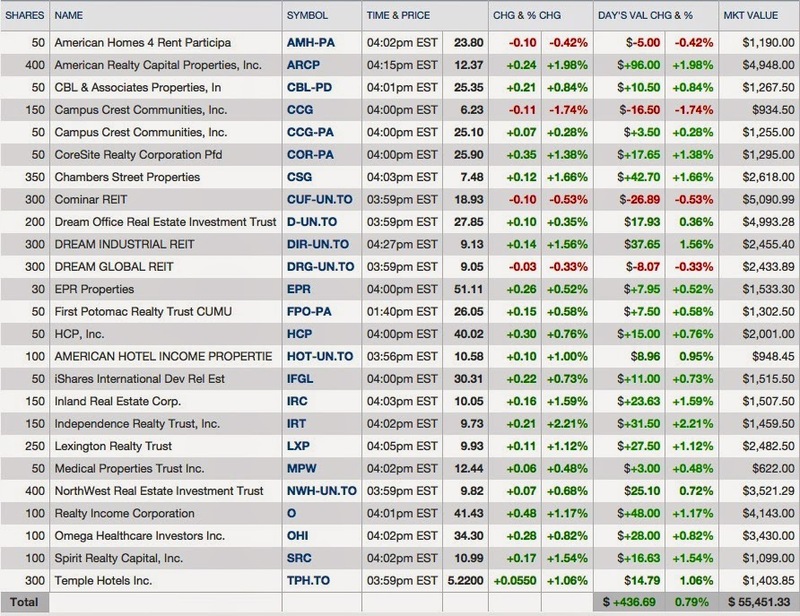 REITs have had a bad September and many of them are selling below their 50, 100 and 200 days SMA lines. Fortunately, my main problem, CCG, is a small 150 share position. 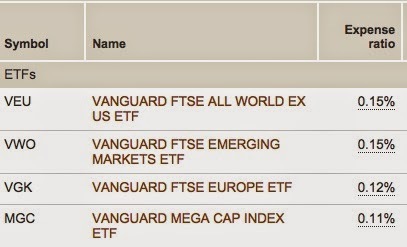 Vanguard REIT ETF (VNQ), one of the benchmarks that I use for this basket, has declined 4.88% over the past month but was still up 14.84% YTD through 9/26/14. Washington Trust moved up after raising its quarterly dividend by 3 cents per share. The new quarterly rate will be $.32 per share ($1.28 per share annually). My total cost number for my remaining 50 shares is $767 or $15.34 per share. Since NYCB is unlikely to raise its dividend, I would expect WASH to surpass the dividend yield of NYCB next year based on my constant cost numbers. In 2013, my dividend total from this basket totaled $1,932,93, up from $1,896.25 in 2012 and $1,660.57 in 2011. I will have to increase my current exposure in order to exceed the 2013 amount this year, given my light exposure for the first four months which was several thousand below the "minimum" level. I may make some light adds during October assuming the correction in prices continues. The abnormally low rates benefited banks some when deposit yields were repriced down, but even 5 year bank CDs taken out in 2008 at higher rates have now matured, and the positive impact of that repricing is no longer present to any meaningful degree. Instead, the decline in rates for loans simply compresses net interest margin. When rates were rising last year, regional bank stocks were in an uptrend based on the common belief that higher intermediate and long rates would be a net positive for them, particularly when short terms were likely to remain near zero through mid-2015 and then rise slowly and modestly in 2016-2017. The rate spike starting last May impacted intermediate and long term rates. Short term rates remained anchored by ZIRP. I have used the downdraft in prices this year to add positions to my basket after selling into last year's strength. Regional banks have had a tough September. I have lost since the last update about $1,000 of my unrealized gain. Through 9/26/14, the SPDR S&P Regional Banking ETF (KRE), which is my benchmark for this basket, was down -4.83% and had lost -2.34% over the past month. National Penn Bancshares is in the process of acquiring TF Financial, a savings and loan, with 18 full services offices in PA and NJ. When announcing this acquisition last June, National Penn Bancshares asserted that the deal "is expected to accrete National Penn earnings per share by $.04". National Penn recently sold $125M in senior unsecured notes, bearing a fixed coupon rate of 4.25% and maturing in 2024. I own 30 shares as part of the LT basket. Item # 1 RB Bought as LT 30 NPBC @ $7.83 (4/26/11 Post) Those shares are still in that basket. This bank ran into some trouble during the recent Near Depression and cut its quarterly dividend from $.175 to $.01 in 2009 before starting to raise it again in 2011. The current quarterly dividend rate is $.1 per share. When I added this lot, the shares were then trading at below the 50, 100 and 200 day SMA lines. NPBC Interactive Chart I am more concerned about whether I am paying a fair price for the shares, rather than Mr. Market's current opinion about the shares. It is common for me to buy when the chart looks lousy. At the time of my purchase, the consensus 2015 E.P.S. estimate was $.79, up from $.69 in 2014: NPBC Analyst Estimates. Assuming those numbers are hit, which appears to be a reasonable guess, the forward P/E is about 12.81 at a total cost of $10.12 per share, with a 14.45% growth rate in E.P.S. Y-O-Y. The dividend yield is close to 4%. Altogether, the valuation and yield justify an add in my opinion, notwithstanding the technical weakness. I have developed a routine with this very small Kansas bank. I have been buying when the price falls below $20 and selling when the price goes over $22. I did not miss a quarterly dividend after selling the earlier lot. LARK bounces around pretty good on extremely light volume. Only 514 shares traded last Friday. I finished writing the post this evening and decided to publish it before Saturday morning. I now have to write the monthly update on three basket strategies that will be published on Monday. A SA contributor used this site, Dividend Reinvestment Calculator, to calculate the total returns for a stock which would include the reinvestment of dividends. It is worth bookmarking, but I can not vouch for the accuracy of its calculations. As noted below, I continued to take some profits in equity REITs. That sector has performed poorly, going into a minor tailspin, when the 10 year treasury rose from a 2.34% yield in late August to 2.6% a few days ago. Investors no doubt remember the big hit taken in this sector starting in May 2013 through December 2013 when the ten year treasury rose from 1.66% to 3%. Daily Treasury Yield Curve Rates Some of my best buys in the REIT basket occurred in December at the peak of that rate rise. Bought: 100 Realty Income (O) at $36.96 (12/10/13); Bought: 00 OHI at $29.85 (12/23/13 Post); Bought 50 HCP at $36.31 (12/31/13 Post) All of those have retreated in price significantly from their 2014 highs. Subsequently, rates started to decline in 2014, surprising many, and that decline gave stocks viewed by many as bond substitutes a big lift. 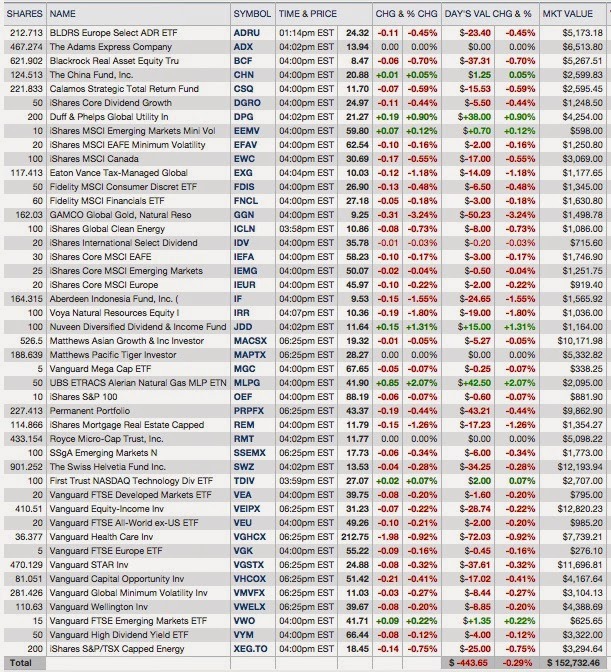 Prior to the recent rise in rates, the Utility XLU and the REIT ETF VNQ were among the best sectors for investors this year. Even with their recent price declines YTD performance is still good, but more may be subtracted from the YTD returns later in the year. No one can predict the future other than a few pundits who believe that they have a method to accurately predict the future, some sort of divine omnipotence or maybe something else entirely. I responded to one of those supreme beings in several recent comments at SA. I can only say that I am concerned about a rise in rates and that has motivated some profit taking in the REITs. Last week, I started to nibble by buying two back. The 10 year TIP break-even spread closed today at 1.97% and has been trending down. Markit's September flash U.S. manufacturing was reported at 57.9, a 52 month high, with employment growth hitting a 2 1/2 year high. Markit reported that backlogs increased across the entire manufacturing sector. Underlying demand was described as "robust". One major reason for the slow recovery is that new home construction, which normally leads the country out of recession along with light vehicle sales, has not provided its normal economic push coming out of a recession. I am expecting a gradual improvement in new home sales and all of the economic activity generated by the new home construction. There are several reasons. Housing stock has not bee keeping up with household formations. Large numbers of foreclosed homes, which have been abandoned and vandalized, are being bulldozed to the ground (just google "demolishing foreclosed homes"). As more years pass since the traumatic housing price decline, people quit thinking about that past and focus more on the future, including the many long term advantages of home ownership. Mortgage rates are still way below historical standards, and prices in many localities are still well below their respective peaks reached in 2005-2007. Security Description: Artis Real Estate Investment Trust(AX.UN:TOR) is a diversified Canadian REIT that owns office, retail and industrial properties in Canada and the U.S., with a focus on Western Canada. As shown on that property map, U.S. properties are concentrated primarily in Minneapolis and Phoenix to a lesser extent. The dividend yield at a total cost of C$14.36 is about 7.52%. The yield at a total purchase price of C$15.71 is about 6.87%. Prior Trades: I flipped two 100 units lots in 2011. The tax gain will be dependent on the currency conversion values and will not simply reflect the change in value based on the Canadian share price. Given the high commission cost, I decided to buy 300 units back in September 2013 rather than just a 100 units. Recent Earnings Report: For the 2014 second quarter, Artis reported AFFO per unit at C$.3, resulting in a payout ratio of 90%. (page 9: Q-2.pdf) Total long term debt and bank indebtedness to gross book value was reported at 48.6%. Same property net operating income increased 3.3% Y-O-Y. Portfolio occupancy was at 95.9%. Rationale: The goal of the Canadian Dollar strategy is to increase my CAD stash and consequently to diversify some out of USD priced assets. I accomplished that objective by receiving a year's worth of dividends and a decent CAD profit. The CAD profit was certainly tax efficient as shown above which is a bonus. I would not want to sell one of my Toronto listed securities at a USD taxable profit but at a CAD loss due to the rise in the CAD after purchase while the ordinary shares declined some in price. Future Buys and Sells: If REITs correct again due to a rise in rates, I will consider buying back the Toronto listed shares with my CADs, hopefully after a 10% to 20% correction in price. Another alternative is to buy the ordinary units listed on the pink sheet exchange which are priced in USDs. My commission for the purchase of those units would be my regular Fidelity commission of $7.95. ARESF Artis Real Estate Investment Trust In addition to the lower commission cost, those units would be the best way to play a rebound in the CAD, compared to using my CAD stash to buy the units in Toronto. In that scenario, I could realize a USD gain while actually having a CAD loss due to the rise in the CAD vs. the USD. And, buying ARESF would be much better than buying the Artis units in Toronto using USDs now (receiving basically the same benefit in price as with ARESF before fees and commissions) and then converting the sale's proceeds from CADs back to USDs. In the later scenario, I would pay Fidelity a 1% fee for each currency conversion plus a higher commission rate. I will be looking at the ARESF prices daily next week. The stock went ex dividend for its monthly distribution today. BDCs have been under consistent selling pressure over the past few weeks. The externally managed ones that I follow, including ARCC, are now selling at discounts to their net asset value per share and below their 50, 100 and 200 days SMA lines. Their charts look like falling knives. When confronted with this kind of problem, I will frequently chop orders into small lots and average down at predetermined target levels. For ARCC, I would consider buying 50 shares in a taxable account at below $15.9. Security Description: Ares Capital is an externally managed BDC. I have an extremely negative view of externally managed BDCs, viewing the compensation paid to the external managers to be way out of line with performance. I would label ARES now as a serial issuer of common stock. For the externally managed BDCs who were in existence prior to the Near Depression, ARES held up much better than most. The share price was over $20 in 2007 and traded near $3 in early March 2009. ARCC Interactive Chart That highlights the recession risk issue. Prior Trades: My highest cost shares are owned in another ROTH IRA: Bought 70 ARCC at $17.24-REGULAR IRA (April 2013) Whenever I can sell that lot profitably, I will do it. Recent Earnings Report: The last reported net asset value per share was $16.52 as of 6/30/14, page 2 10-Q (debt listed at page 73). A list of investments can be found in that 10-Q filing starting at page 5. ARCC missed expectations in its last earnings report and that miss has resulted in a persistent, though relatively small, price decline. The overpaid Masters of Universe will need to do better in the coming quarters. I prefer to call them Masters of Disaster. Total operating expenses rose 19.69% Y-O-Y ($130.013M vs. $108.627M). Net investment income, however, declined by 1.7%. Loans on non accrual status represented 1.9% of total loans. For the 2014 second quarter, ARCC reported core E.P.S. of $.34 and net investment income of $.31. SEC Filed Press Release The estimate was for core E.P.S. of $.37. The number of portfolio companies stood at 202. The weighted average yield on total investments at fair value was 9%. The weighted average yield on debt investments at fair value was at 10%. Rationale: As always, the idea is to collect a year or more of dividends paid by a BDC and then escape somehow without losing money on the shares. It is not helpful to be paid a 11% dividend and to lose 10% on the shares. With the recent slide in the share price, the dividend yield rose some. At a total cost per share of $16.38 and assuming a continuation of the current quarterly dividend $.38 per share, the yield is about 9.28%. And, importantly, that yield is tax free in the ROTH IRA now and when and if I withdraw the dividend from that account, at least under current law. Congress may at some point, when hunting for revenue to feed the beast, change the rules. ARCC is probably the best externally managed BDC. Risks: The company describes the myriad risks incident to its business starting at page 29 of its 2013 Annual Report, 10-K The risk summary ends at page 52. Again, I will emphasize the "conflicts of interest" discussion starting at pages 38-40. It is my view that externally managed BDCs exist primarily to enrich their managers. Externally managed BDCs suffer from a variety of problems that are related to the compensation arrangements paid to the managers which include a base management fee (applied to total assets including those acquired with debt) plus an incentive fee that is exceedingly generous. The incentive is to increase assets through a constant flow of stock offerings, irrespective of whether that is in the interest of existing shareholders and even if the price to the underwriters is below net asset value per share. The general tendency of externally managed BDCs is to erode their net asset value per share over time. Since the market price will generally hug net asset value per share for externally managed BDCs, there is almost an inevitable built in mechanism that results in either share price stagnation or an elevator perpetually moving to the ground floor (though occasionally it may go up a floor before going back down again). ARES has done better with its current net asset value be above where it was in 2005. Recognizing that the managers have conflicts and that the downside pressure to the share price over time, made worse by recessions and/or ill advised risk taking that would not occur without the compensation arrangement, I do not view BDCs as suitable for long term holds and I would certainly not want to own any of them when there is a recession on the horizon. Future Buys/Sells: I am more likely to pare my existing position than to buy more shares. I would consider, however, buying another 50 share lot at below $15.9 in a taxable account where I currently only own 50 shares, provided the net asset value per share does not decrease in subsequent earnings reports. I will definitely sell my highest cost shares (a 70 share lot bought at $17.24) owned in another IRA account when and if I ever have a profit again. 3. Bought 54 ESD at $17.67 (see Disclaimer): This was a partial fill of a 100 share limit order. The stock went ex dividend the day after my purchase. Security Description: The Western Asset Emerging Markets Debt Fund (ESD) is a leveraged foreign bond CEF. Most of its bonds are denominated in USDs however, as noted below. In the latest Oppenheimer Chart Update (6/30/14), there is an interesting chart at page 34 that shows the public debt to GDP ratios of several emerging markets compared to the U.S., Japan and other developed countries, and then compares the sovereign debt yields on another axis. The emerging market countries have far lower debt to GDP ratios and far higher sovereign debt yields. Oppenheimer concludes that the market has not "fully" recognized that emerging market countries and central banks have "grown much more disciplined". The chart at page 25 shows how emerging market debt has performed against other debt categories in each year since 2004. Emerging market debt was the top performing category in 2004-2007, 2010 and 2012, so that is a reason why I will not totally ignore that bond sector. Those bonds were in last place in 2011 and 2013. Emerging market currencies and bonds declined significantly last year when U.S. interest rates started to rise in May 2013. For those investing in emerging markets, there is an important chart on page 35 that shows current account as a percentage of GDP for several emerging market countries. The chart compares 1997 with 2013. The Philippines, Korea and Malaysia have gone from a negative ratio to positive ones, while India, South Africa and Turkey have increased their negative numbers. Rationale: Given the correction in emerging market debt, I thought that I wound nibble in this area and hope that the correction is mostly in the rear view mirror. You never really know. The ESD share price had fallen 4.69% since I sold out a few weeks ago and is substantially below the $22 level hit back in early 2013 before U.S. rates started to rise. Assuming a continuation of the current monthly dividend of $.115 per share, the dividend yield is about 7.81% at a total cost of $17.67 per share. The dividend has not been supported by a return of capital over the past year according to CEFConnect. Risks: The risks are highlighted in a long term chart. ESD Interactive Chart This CEF crashed and burn during the Near Depression, rapidly going from $18 or so per share to $10. Another mini crash started in May 2013 with a plunge from $22 to $17 over a 4 month period. That is huge for a bond fund. Since late August, the market price has stabilized mostly in the $17 to $18 range. "Country Risk" is acute. I noted above the significant exposure to Venezuela's government bonds. The fund even had an allocation to Ukraine as of 6/30/14. Then, there are the risks associated with CEFs, interest rate and credit risks-all kinds of potentially problematic risks associated with that 7.81% yield. Consequently, I will trade emerging market bond CEFs and keep my total exposure minimal at all times. A rise in U.S. interest rates will likely cause a decline in emerging market bonds. ESD avoids most currency risk by owning bonds denominated in USDs, though it has some EM currency risk through securities priced in local currencies. Future Buys/Sells: I am anticipating a more probable than not scenario for an average down given the weakness in this sector. If and when the shares decline below $16.75, I will consider buying 46 shares, thereby bringing the position up to 100 shares. I would consider selling the entire position when and if I achieve a 10% total return. The general idea with this kind of security is to generate income while avoiding if possible a capital loss. Ford's U.S. sales in August were up slightly to 222,174 vehicles, led by the best ever sales of the Ford Fusion and Escape. Ford recently reported that European sales increased 14.4% Y-O-Y in August. YTD European sales increased have increased 7.1% through August. Ford's sales in the five largest European markets rose 35%. Sales in China were up 30% YTD with 717,537 vehicles sold. Link to recent bullish article published by Seeking Alpha. In a Credit Suisse report summarized in a recent Barron's article, the CS analyst believes that Ford has more near term potential than GM, based on the new F150 launch. 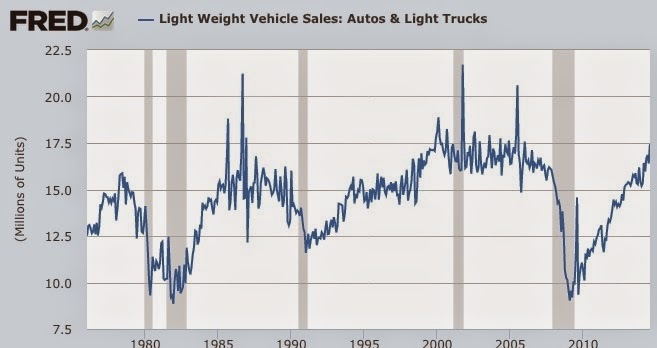 The analyst noted that investors had trimmed their auto exposure significantly during 2014, as many believe that the market is in a late cycle with a seasonally adjusted annual rate above 16M units. I would just note that the 16+M annual run rate has lasted for about 7 years after reaching that level back in the late 1990s, and that the current run rate is of a recent origin occurring after several years of abnormally low sales. Ultimately, the future depends on job and wage growth and an overall improving economy with lower than normal interest rates. Related Trades: I have bought and sold Ford and Ford Motor Credit bonds but do not currently have a position. Last Earnings Report: For the 2014 second quarter, Ford recorded a pre-tax profit of $2.6B. After tax E.P.S., excluding some items, was $.4 and $.32 with items, up from $.3 in the 2013 second quarter with items. The 2014 second quarter had $481M in charges, primarily related to the impairment of an equity investment in Ford's Sollers joint venture in Russia and separation related actions in its European operations. Ford's European operations were on track to profitability in 2015. There was only a $14M pre-tax profit in the 2014 second quarter, which was a $320M improvement from the year ago quarter's results. Ford, however, expects the second half loss to be greater than the first half loss of $180M. The Asia-Pacific region is a bright spot, reporting a pre-tax profit of $159M, up $29 from the 2013 second quarter. Ford Credit's pre-tax second quarter profit was $432M, down $20 from a year ago. Ford expects that Ford Motor Credit's 2014 pre-tax profit will be higher than in 2013. Rationale: When the economy and the stock market are in a long term secular uptrend, with temporary and relatively mild downturns, Ford Motor's stock can perform well. Adjusted for stock splits, the price went from around $1 in 1982 to over $32 in 1998, the high water mark for the stock. F Interactive Chart The stock then cratered, falling to near $7 during the 2000-2002 correction and the 2001 recession. Over the past year, there has been a lot of chop in the stock price, mostly moving in a $15 to $17 channel. At the time of my purchase, the stock had pulled back from a $17.6 close (9/2/14) and had fallen below its 50 and 100 day SMA lines, though still above its 200 day SMA which was at $16.28 at the time of purchase. One reason for buying Ford stock is that I expect the U.S. economic recovery to pick up steam during the 2014 second half and throughout 2015. Consequently, I would expect an acceleration in both revenues and profits. At the time of my purchase, the consensus E.P.S. was for $1.33 in 2014 and $1.92 in 2015, F Analyst Estimates, and that profit growth is consistent with my thesis of growth. Ford also expects European operations to significantly improve in 2015, as noted above when discussing the 2014 second quarter report. The problem is that investors realize Ford is a cyclical company and the downturns can be very severe. A market multiple will not be place on a TTM E.P.S. or the forward year's projected E.P.S., even when earnings growth Y-O-Y is far superior to the S & P 500 average. Consequently ten times the $1.92 estimate may be optimistic as a price within the next 12 months. I would view a $19.2 price within a year plus two quarterly dividends to be a best case scenario within 6 to 9 months. A better outcome could be accomplished when investors have a better picture regarding the longevity of the U.S. recovery and when Europe will start to contribute meaningfully to worldwide economic growth. Ford is moving toward better economies of scale by reducing the number of common platforms. By 2016, Ford anticipates that 99% of its global production will come from 9 platforms (5 global/4 regional), according to Morningstar's report. Risks: A recession could easily send the stock price down to below $10 and result in a dividend cut. A key unknowable is the market multiple that investors will place on Ford's admittedly cyclical earnings during an economic upturn. For this investment to be successful, it is not necessary that the market assign a market multiple. The current multiple is close to 8.6 times projected 2015 earnings with a projected growth rate of 44.4% Y-O-Y. Something significantly higher than that multiple will be necessary. There has been a large number of recalls recently. Future Buys/Sells: Considering the risks and the uncertainties, outlined above, I have modest goals with this small buy. I will consider selling the position when the annualized total return is in the 10% to 15% range. I may hold off based on my assessment of the longevity of the economic upturn. If my best guess is that there will be a synchronized worldwide upturn lasting five more years without a U.S. recession, made say in June 2015, then I would be far more likely to hold the stock. FYI, I went to the total return Calculator, referenced in the introduction, and found that the annualized total return for Ford stock was 9.27% with dividend reinvested since 1/1/1972. Company Description: The National Australia Bank Ltd. ADS (NABZY) is an ADS for the ordinary shares of the National Australia Bank Ltd. (NAB:ASX). One share of NABZY equal .5 ordinary NAB:ASX shares. I used the currency exchange converter at YF to translate than number into USDs. The value will fluctuate during the day. Since the ADR is equal to .5 ordinary shares, I need to divide $29.75 by two in order to calculate the equivalent price for NABZY which is priced in USDs. That price would be $14.88, which is close to what I paid for the NABZY shares bought after the Australian exchange had closed for the day. Prior Trades: Prior to this last trade, I owned 50 shares: Item # 8 Bought 50 NABZY at $15.49 (3/10/14 Post). The stock went ex-dividend for its semi-annual distribution after that purchase. Prior trades were made before NABZY split 2 for 1. I traded this stock a couple of times before the ADRs split two for 1. Item # 1 Bought 50 NABZY at $24.7 (March 2010) and Item # 9 ADDED 50 NABZY AT $19.51 with Mid-May cash flow (May 2010)-Item # 2 Sold 100 NABZY at $25.2-Sold 100 NABZY at $25.2)($285.6 +$64.59 dividend payment); and Item # 7 Sold 50 NABZY at $25.47 (August 2012)-Bought 50 of the ADR NABZY at $24.55 (collecting one dividend). Rationale: This bank pays a good dividend. Dividends are paid semi-annually in Australian Dollars. NAB's dividend payment history - NAB That page refers to the "franking level" of recent dividends as 100%. I believe that means that no withholding tax would be applied to the payment. In 2013, NAB paid out AUD$1.9 which would be equivalent to AUD$.95 for NABZY now after the 2 for 1 split. At the exchange rate in effect for 9/18/14, AUD$.95 would convert into USD$.8511 per share. At a total cost of $15, the dividend yield would be 5.674% based on all of those assumptions. The value of the dividend to the owner of NABZY shares will in part depend on the currency conversion rate. The dividend becomes more valuable when the AUD rises in value against the USD, and less valuable when the Australian currency is declining, which has the same practical effect as a dividend cut. So assuming that one AUD bought 1.05 USDs at the time of the dividend conversion, then the owner of NABZY would in effect receive more and would have a higher dividend yield based on the constant cost number. Going back to the 8/10/12 conversion rate, that AUD$.95 per share share dividend would convert into USD$1 which would equate to a 6.67% yield at a total cost of $15 for each NABZY share. The dividend yield goes up when the AUD rises against the USD based on a constant cost number for the shares and goes down when the AUD loses value which has the same effect as a dividend cut. In order words, the U.S. owner of NABZY would want the AUD to gain in value against the USD after purchase, but the dividend's value is not the main reason. The NABZY share price is inextricably linked to the price of the ordinary shares in AUDs converted into USDs. 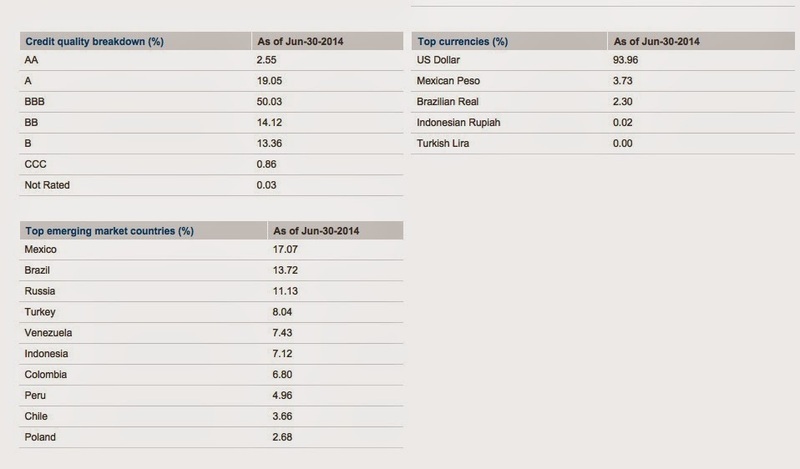 As previously discussed, that currency loss will flow through into the pricing of U.S. listed ADR priced in USDs. What happens when the price of the ordinary shares and the AUD go up at the same time? This is just a hypothetical, but I can pick a historical time when the AUD was strong against the USD, with one AUD buying more than 1.0574 USDs. I did not have to go back far in time. So that is a huge difference converting AUD$33.21, as of 9/18/14, into USDs which resulted in a USD$29.75, and converting the same AUD$33.21 on 4/13/13 which simply isolates the impact of currency on the U.S. ADR price after a significant decline in the AUD/USD exchange rate. The ADR market price decline due solely to the currency exchange was 14.33%. Risks: Given the recent weakness in the Australian Dollar, currency risk is significant, but it can cut both ways as noted in the preceding paragraph. Many commentators believe the Australian housing market is overheated. There are geographic areas in both Canada and Australia where housing prices have increased at far faster levels than incomes, an ingredient underlying the busting of the U.S. housing bubble. Needless to say, we are all familiar with how banks react to major declines in home prices. I limited this average down purchase to just 50 shares due to these concerns and risks. Future Buys: I decided to chop a potential order for 100 shares into two 50 share lots primarily due to the ongoing weakness in the Australian Dollar. The shares have now continued to slide below the last 50 lot purchase price. I will consider averaging down at less than $14 with another 50 share lot purchase. I will refrain from averaging up. When I average down in these dribbles, I will frequently sell the highest cost lot bought first whenever I have a profit after commissions, so a $16 price would give me some profit on that first lot bought at $15.49 plus the dividends. 6. Sold 300 HealthLease Properties at C$14.175 (Canadian Dollar (CAD) Strategy)(see Disclaimer): HealthLease Properties Real Estate Investment Trust agreed to be acquired by Health Care REIT (HCN) for C$14.2 per unit in cash. I was lucky on this one, having bought the shares a few weeks earlier. Rationale: I was thinking too much about what I should do with this lot, and finally decided to just harvest the profit and move on.